When our kids are little, one of the most meaningful times of the day is when we tuck them into bed at night. We quite often make a ritual out of it. We draw a warm bubble bath for them complete with their favorite rubber ducky and various other toys. We read to them from delightful books. We cuddle and giggle and make delicious memories with them. As long as we aren’t in a hurry, bedtime can be a wonderful memory we make with our kids. So, why do we stop tucking our kids into bed as they get older? I’m here to tell you that you should also be tucking your teens in at night. Just because our kids are getting older doesn’t mean we should stop tucking them into bed at night. In fact, the bedtime routine with our older kids is probably even more important than it is with our younger ones. 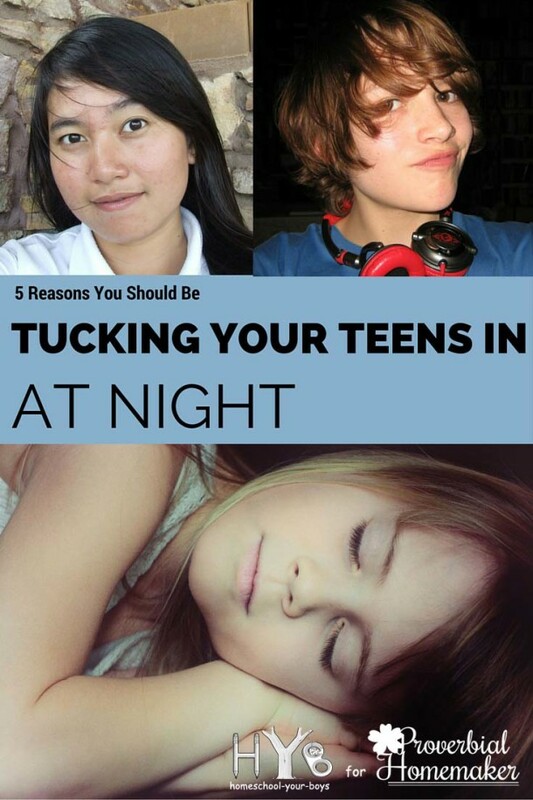 Tucking Your Teens in – Why is Bedtime Important with Older Kids? As our kids get older, they quite often start to pull away from us parents. They have all sorts of thoughts that they no longer share with us. They have hopes and dreams and fears that they keep to themselves more and more. Shows Them We’re Interested – When we’re willing to ask our kids their opinions about various matters, they will be much more willing to listen to our opinions as well. Talk with them about various events that occurred throughout the day. Ask them what they’re thinking. Ask them questions that don’t have a “yes” or “no” answer. Helps Them to Open Up – Almost magically, right before bed is a time when all of our kids seem more willing to share their hearts. In the evenings, they actually want to talk to us! If we are wise, we need to take the time to take advantage of this important opportunity. Models Having a Servant’s Heart – Probably the last thing we want to do at night is to spend extra time tucking in our kids. At least I know I feel that way! By the time bedtime rolls around, I’m pretty wiped out and I just want to sit and veg. When our kids see us spending this extra time with them, even though they know how tired we are, it is an excellent example for them. Showing our kids how they should treat people is much more poignant than merely telling them. An Opportunity to Pray With Them – As our kids get older, they spend more time doing things on their own and away from the family. We need to grab whatever moments we can to pray for and with our kids. Tween and teen kids are dealing with savage hormones and stressful situations. We need to cover them in prayer! My husband and I take turns tucking our sons in each night and I can’t tell you how many times they’ve poured out their hearts to us at this time. We not only learn how they really feel about events from earlier… but they’ve also shared with us things they’re struggling with as well as things their brother is struggling with. Bonus! These minutes have been times when we’ve been able to strategize together. Sometimes they have become opportunities for confession – for us and for them. Our family has benefited greatly from these conversations through the years. Some families struggle with their teens wanting complete privacy in their rooms and not wanting their parents to even enter. We’ve never had this problem with our boys. They’re used to us coming in (after knocking, of course) and we feel completely welcome there. Tucking our older kids in at night is a great way to make sure they don’t isolate themselves from the family. Our younger children benefit from having loving bedtime routines and so do their older siblings. If you’ve gotten away from tucking your older kids in at night, resolve to make a change. Tonight, as your children prepare to head off to bed, consider creating a new routine with them which will have a lasting impact! Question: Do you tuck your older kids in at night? If you do, have you found that tucking them in has been beneficial? Please leave a comment below. Yes I’ve tucked my oldest daughter in at night until she left home, and my youngest will remind me to tuck her in. Even if my oldest daughter is staying over night she will say tuck me in. She once told me ( after asking her why she wanted me to her being older and on her own) she said it makes me feel safe,and warm. That’s so heartwarming to hear, Lisa. I know my teenage boys appreciate it as well. Every night, they ask who is tucking them in so that they can give the other parent a hug before they head to their rooms. It’s a special time in our house as well! That’s wonderful, Kelly. I love it! Yes, my family is very huggy as well. That all started when my brother was killed unexpectedly. We just never know how long we will have to spend with each other so we need to cherish those times together – and make sure we tell people that we love them. Thanks so much for sharing your story! My boys are 22, 15 & 14 and I still “tuck” them in at night. I still read to the younger two (they share a bedroom), my oldest started shutting his bedroom door at bedtime when he was 18. The boys actually look forward to bedtime reading with Mom (or Dad on his nights off, we each read our own book). That’s wonderful, Cari. Yes, reading aloud to our older kids is another excellent thing to do. We still read aloud to ours as well – and listen to audio books as a family. Thanks for sharing that idea! Wow…this has challenged me! Things is my teens usually go to bed much later than me! BUT I know I still could make that effort to sit with them and say goodnight before I go to bed. Thanks so much for sharing. My 14 year old son & I still read together every night at bedtime. (We have been through the entire Harry Potter series more times than I can count – they’re his favorites!) It is also a great time for talking over things that are on his mind. I look forward to that time with him every night. That’s so good to hear, Marci! Many nights we tuck our 13 yr. old son in together, but sometimes just one of us. We pray together every night and have all our son’s life. Tonight, my son was having an attitude with me. I was tired of it and hurt, and I just said good night and your dad will tuck you in. I walked away. Shortly after, I saw your post. I hadn’t even read it then, just the title. I immediately went to my son and said I was coming in. He asked why, in a not too inviting tone. I simply told him the truth. I said I was coming in to say goodnight and hug because I love him. It made such a change in his countenance. He said he couldn’t sleep. I laid on the covers next to him and just talked about how I just wanted him to be less snappy with his words and that I loved him and wanted him to be at peace. He fell asleep almost before I could leave the room. Now I am at peace, too. This was so touching it brought tears to my eyes. Thank you so much for sharing! I’m thankful Michelle was able to bless you and others with this post! Highlight of my day is the tuck-in time! Kids open up, and we have each other’s undivided attention! Both of us always tuck our teenager in, even when he occasionally sulk or says he doesn’t want us to. As an older parent with some severe health issues, it can be hard to stay up long enough to do so. I am always blessed by this, especially when there is tension or issues we have not been able to deal with during the day. I also have a cheesy secret knock for our adjoining wall..the last thing he hears after I love you is my silly knock on the wall by his bed. By the way, my grandmother tucked me in till I got married, and it was hard to give that up when my husband came along ! If I visited alone, she tucked me in until she went home to the Lord. I tucked her in the last year of her life and the sweetness of those memories will always remain. I still tuck in our 14 yr. old son, Jacob. We always pray together and he says a Praise and a Request and then I pray. We talk about our day if we’re not too sleepy and then I rub his hands. It is just the sweetest time of day and I will continue this tradition as long as he likes it. Thanks for posting how important it is to love on our teenagers. They need it, and so does the parent! I am on day 50 of being a parent. My 16 year old niece and 15 year old nephew’s parents both died this year and they came to live with my husband and I 8 weeks ago. I’m tired and had to google some advice on saying goodnight every night. I came across this article and didn’t even have to read past the first few sentences before I went and found both of them and said goodnight and chatted. I know how important it is and I would have never gone to bed without saying goodnight to my mom when I was young. I hope I can instill this soon enough in these kids as well. Thank you for the parenting advice and the encouragement I needed including the comments! My husband keeps talking very negatively about me tucking my sweet, 14 year old son in. It really bothers me and makes me feel weird when I don’t think I should feel weird at all. I’m just thankful that my son still wants to talk to me and hug momma goodnight. I’m also thankful he isn’t trying to grow up too fast. He is so responsible, respectful and well behaved. There is a 13 and 15 year old couple we know who are pregnant. That could be my kid, but he is interested in church and Learning the Bible, drum, gospel music and basketball….My son loves Jesus very much and love it when I get that one on one chance to talk to him and pray with him. He always ask me why dad don’t come in there, but he is embarrassed to ask him. He’s probably heard my husband say he’s to old for that. I don’t know how to get my husband, who is a preacher and his step dad to understand my 14 year old son isn’t too old to be tucked in and hugged. Also, before I met and married my husband I had a stroke and my 4 kids were there for me through all that. They know what it’s like to almost lose me. I always want them to feel loved by me. We have twins turning13 tomorrow and we have not stopped tucking them in bed as we see the benefits you’re talking about and we totally agree!